The dramatic escalation in mental health disorders in recent times are effects of a global shift in the vast body of humanity. The most radical changes are happening at the cellular level as an adaptation to the influx of electromagnetic pollution in preparation for humanity’s future relationship with artificial intelligence. The transition period could last hundreds of years in earth time, which is just a blink of the eye from the eternal perspective. We still have a good way to go – that is if nuclear war or some other catastrophic event doesn’t wipe us out in the meantime. After all, there’s no certainty in this existence. The power behind the evolutionary process is synonymous with cosmic intelligence and able to anticipate global changes long before they manifest on the earth. Within the human body are discrete energy shields that filtrate harmful substances, which would otherwise build up and undermine the efficiency of the major bodily functions. However, the effects of electromagnetic pollution are now compounding at such a rate that it’s causing a global psychosis affecting virtually everyone in one way or another. The dilemma is that no protective shield has evolved to offset the full effects; it wasn’t necessary in the grand scheme of things because the physical body itself was naturally earthed to neutralise any surplus build-up of electrical energy. The human race, in going it alone in defiance of the creator God, has now deflowered the earth to such an extent that we’ve short-circuited the incoming current of vital life. The difficulty is that electromagnetic pollution, generated by the billions of electrical devices, is unable to be recycled or filtrated from the earth. The electrical waves build up and rise to the stratosphere, but only so far before they bounce back towards the surface as invisible currents of reactivated energy. The overall effect of electromagnetic pollution is making our bodies harder and less sensitive to our original nature of love. People are more restless and irritable because the natural restorative power of nature and the blessed earth is unable to replenish the vital body as before. It’s rare these days to see anyone without their phone or tablet at a restaurant or even in the park. Consequently people are more unpredictable, giving rise to road rage, air rage or whatever label the media ascribe to such random behaviour. Our intimate relationship with the planet is rapidly diminishing. The electrical waves and currents generated in the body are facets of our spiritual system. Nerve impulses are electrical energy signals that combine to create a magnetic field around the body. The field is sometimes referred to as the aura and can be perceived by some people able to tune in to another’s psychic frequency. The effect on the electrical charge between each brain wave on those most vulnerable to electromagnetic pollution can trigger a wide range of disorders that might otherwise remain dormant within the body. For example, any propensity for mental illness such as Dementia or Alzheimer’s could be set in motion through any electrical malfunction of the brain. Although a tragedy, the imperceptible value is that this is an involuntary sacrifice by those afflicted in order to prepare humanity for the next evolutionary phase. Through necessity, our cellular structure is being electrically programmed in preparation for human beings to integrate with artificially created life forms as a total life experience. In the future, the relationship between human beings and artificial intelligence will create a sub-culture or hybrid of the two species. In the 1960s the introduction of hallucinogenic substances and subsequent drug culture prepared future generations for deeper insights into the psyche. Today, the proliferation of electrically charged energy is a preparation for a deeper engagement in the sterility of a virtual reality. The saving grace is that future generations born into a robotic environment with artificial intelligence will be none the wiser to the old way of life and accept everything as normal. However, human robots, despite being identical in appearance, will be unable to replicate the psycho-spiritual exchange that occurs in sexual union between the male and female principles. 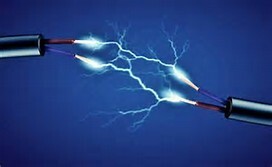 The power of love generates an electrical charge unlike any other. The two bodies fuse in union as the perfect conductor of spiritual energy, which is the only means in existence that original truth and knowledge can be realised from the Source. At the octave of cosmic love, this is the merging of the earth’s spirit with the blackness of infinity and the mystery of the Divine.